Emad Farhan is haunted by war. The 18-year-old and his family fled Iraq when violence in their hometown, Fallujah, became too dangerous. They first went to Malaysia and then on to Cambodia. The Farhans now live in the capital Phnom Penh and own a Middle Eastern restaurant on a street where the road is full of motorbikes and the pavement is lined with tangles of low-hanging power lines. 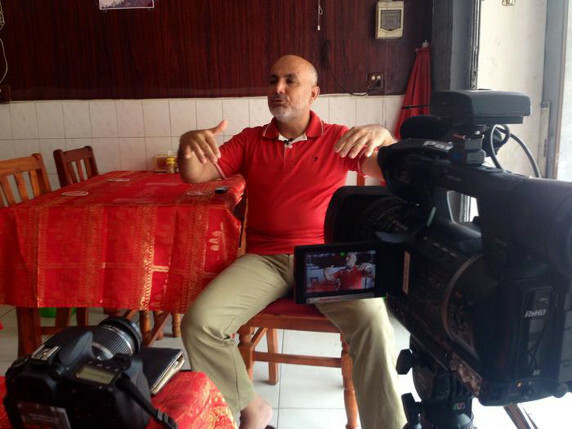 Emad’s father, Hashim, says the restaurant has helped them to fit in. The Farhans live in Cambodia on business visas, which they have to pay for, and are not refugees. After fleeing their hometown they applied for refugee status in Malaysia but it was too difficult for Hashim to secure visas there for his wife and five sons – Mohammed (26), Ahmed (24), Yassir (22), Emad (18) and Ali (15) – so they moved to Cambodia while they waited for an outcome of their claim. That was almost a year ago. Their story is unusual in a country still recovering following the Khmer Rouge regime of the 1970s , which saw more than one million people killed. It’s a place where few people come to after fleeing war, but 51-year-old Hashim says they have been made to feel welcome. The family represents what Immigration Minister Peter Dutton claims will be possible for refugees who are settled in Cambodia under the government’s $40 million refugee resettlement agreement. Following the signing of a second Memorandum of Understanding (MoU) with the Cambodian prime minister in Canberra last week, Mr Dutton said refugees who came to Cambodia from Nauru would be supported. “We want to be able to give people who have an entrepreneurial spirit the chance to open up their own business if that is their want,” he said. But human rights groups say a country with less than 100 refugees and a host of issues such as poverty, corruption and low employment rates is not equipped to give arrivals from Nauru what they need. Support agencies and NGOs in Cambodia will play a crucial role in assisting any refugees who do arrive from Nauru but so far, few have publicly backed the deal. Tek Vannara, chief of the NGO Forum in Cambodia, says most human rights NGOs in the country don’t support it. “They ask the government to solve internal [issues] first, before thinking [about] external [issues] like receiving refugees from the outside,” he says. Steve Cook, a representative of World Vision Cambodia, says the agreement is not something the organisation wants to be involved with. “Cambodia is already facing a lot of challenges and while it’s made a lot of progress in these areas over the last few years…there’s a lot of strains that are still placed on the population and a refugee deal could place pressure on those strains,” he says. In February this year, the International Organisation for Migration (IOM) announced it would facilitate the resettlement of any refugees who volunteered to move. The IOM brought with it a number of new conditions, including that refugees be allowed to live and work anywhere in Cambodia. Before the migration body came on board, the Australian government said refugees would be able to live in Phnom Penh for only a year before they would have to move to rural areas. In a statement to SBS, a spokeswoman for the Minister for Immigration said partnerships were developing. “The International Organisation for Migration has agreed to provide settlement support and assistance to refugees coming to Cambodia from Nauru, and is developing partnerships with a range of NGOs and other agencies in Cambodia to establish these supports,” she said. Under the agreement, the government has committed $40 million in aid to Cambodia to be delivered over four years. The government will also cover the cost of resettlement. So far none of the refugees on Nauru have volunteered to move to Cambodia. According to the Cambodian National Institute of Statistics (NIS) the poverty rate in Cambodia has decreased from 48 per cent in 2007 to 18.9 per cent in 2012. But still the gap between the rich and the poor is still vast and many people live in extreme poverty. Hashim Farhan, who worked as a blacksmith in Iraq, says his restaurant is picking up. The restaurant is open seven days a week and all the family pitches in with cooking and serving customers. Hashim says they are looking for a bigger space but they are hard to come by in Phnom Penh. He originally borrowed money from friends to set up the business, an option that will probably not be available to most refugees coming from Nauru. But Cambodian government representative Phay Siphan says refugees from Nauru will have the same chance as anyone else in Cambodia to be successful. “They have a right to move around the world like Cambodian people, they have a right to become rich if they work hard,” he says. Mr Siphan says the country agreed to take refugees from Nauru for “humanitarian” reasons, and to pay Australia back because it accepted a number of Cambodian refugees after the Khmer Rouge was overthrown in 1979. But the Cambodian government has been accused of double standards for recently deporting a large number of asylum seekers who came to Cambodia from Vietnam saying they had faced religious persecution. The government allegedly deported 40 Montagnards – Indigenous people from the central highlands of Vietnam – without hearing their claims. Mr Siphan says the Montagnards are “not refugees” and the issue comes down to national security. Sitting inside his restaurant, Hashim Farhan says he hopes one day his parents can join them from Iraq. He says they would like to eventually immigrate to Australia or Canada, but right now they are waiting on the outcome of their refugee claim in Malaysia. As customers begin to file into the restaurant for lunch, sons Yassir and Emad hand out menus and glasses of water. Emad says he has made some new friends since moving to Cambodia and he likes to go skateboarding with them. He hopes to study at university and become a chemical engineer. But the loss of friends in Iraq still weighs heavily on him. “I live with them for more than 10 years so [I get] upset and sad when I think about it,” he says. And he hopes other friends still there can join him in Cambodia. “I told them about the life here,” he says. “Life is easy and it’s good.